Allot extra time to get to your destination. It is vital to decrease your speed while driving in the snow, and you should also leave about three times more space than usual between yourself and the car in front of you to give yourself plenty of time to stop. Getting on the road 20 minutes earlier than you usually do should give you enough time to drive slowly and safely and also reach you destination on time. If your car starts skidding, don’t panic! Slamming on the breaks and turning the wheel to avoid a crash are actually more likely to result in an accident. If you are sliding on ice and your tires suddenly regain their grip, the car will turn whichever way the tires are pointed, which can be detrimental if you have suddenly jerked the steering wheel in a certain direction. The appropriate reaction to this situation depends on which wheels are actually skidding out, front or back. If your back tires are skidding out and you have begun to “fishtail”, take your foot off the gas, steer the car in the direction that the back tires are skidding in, and gently apply the break. You may have to steer from right to left until you regain control of the vehicle. If your front tires begin to skid, take your foot off the gas and shift to neutral, this will slow the car down as the wheels skid sideways, and you will slowly regain traction. ALWAYS drive with your lights on in the snow, even if the sun is still out. Visibility is much lower when it is snowing which is why it is so important to keep your lights on and make yourself known to other drivers. Check your levels of windshield wiper fluid! This fluid is helpful in improving visibility as it can be used to melt snow and ice on the windshield. 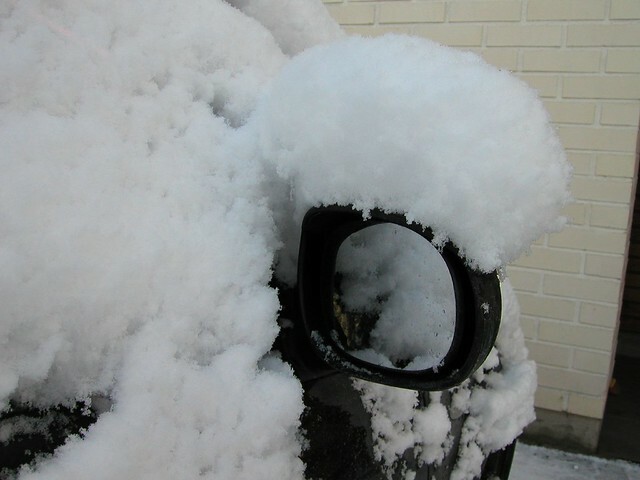 It definitely won’t replace a scraper, but it can be helpful if you find yourself driving in the midst of a storm or have a light layer of snow or ice on your car. Use extra caution when driving over bridges as they are more likely to freeze first. Unlike roads, which only lose heat from their surface, bridges are more exposed to the wind and therefore lose heat on all sides, top and bottom. This results in snow and rain freezing more rapidly, which often leads to black ice. Do not use cruise control. In conditions that are more dangerous than usual it is important to have as much control over the car as you possibly can. Utilizing the cruise control ability of a car can delay your reaction time should your car begin to skid. Do not attempt to pass by snow plows. These trucks typically have limited visibility and you’re better off sticking behind them and driving on a freshly plowed road, than passing them and struggling with roads that are full of snow. Should your car get stuck in the snow, do not hit the gas! This will only spin your wheels and dig you in deeper, instead turn the wheel from left to right in an attempt to loosen snow from around the tires. Keep a bag of salt, sand, or even kitty litter in your trunk, these can all be sprinkled around tires that are stuck to gain traction. Consider alternate forms of transportation. On snowy days it may be more convenient and safer to rely on public transportation such as trains or buses. If they are not in service due to the weather, take it as a hint that you shouldn’t be out driving either. Make sure you have proper car insurance coverage for the risks on winter roads. If you are unsure what types of coverage you need, call a MassDrive agent to learn more. At MassDrive we want all drivers out there to practice safe winter driving. These simple tips can go a long way when it comes to ensuring that you will be as safe as possible on the roads this winter. Bored and on a Budget? These events in Massachusetts are all Free this Month!